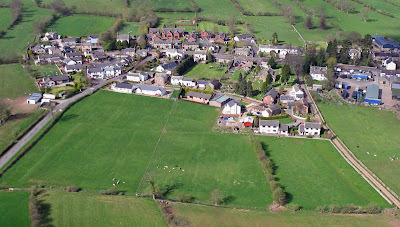 Some of these buildings can easily be identified today as fortified ecclesiastical buildings, their form is still obvious….some are mentioned in historical documents as fortified buildings, but have long since been rebuilt, redesigned or renovated to such a degree that they have lost most, if not all of their original medieval design. It is these latter buildings that are the most challenging to identify, as most times there is only someone else’s research to rely on. 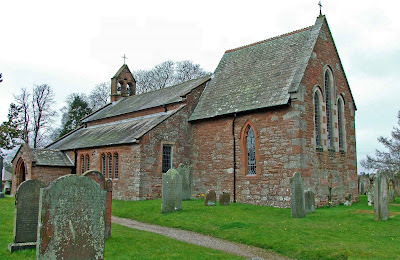 Barton, which sits about three miles South West of Penrith, boasts a beautiful church dedicated to St Michael. 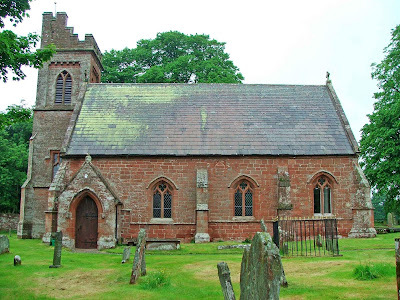 CJ Brooke, in his book, Safe Sanctuaries, states that the church, in its original early medieval incarnation, may have been a place of refuge for the local population. Originally, the 12th century tower would have been an external feature of the church, and it may be this that Brooke is referring to. He makes mention of the huge vaulted ceiling of the tower, now exposed on two sides due to the removal of the walls. This area may once have provided those within its thick walled confines, some element of protection against any wouldbe attacker. 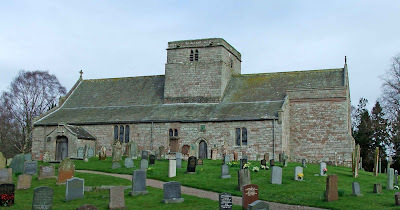 The 13th and 14th century alterations to the church, meant that the tower was, in effect, swallowed up by the new chancel, arcades and chapels. The walls on two sides were removed at this time to allow access to both ends of the church through the tower. 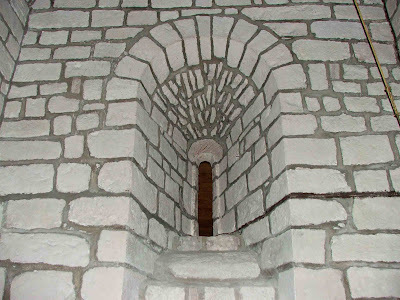 The photo above, shows the thickness of the walls of the central tower. The huge arches that were built at ground floor level, to allow access to the East and West ends of the church, demonstrate the great thickness of the walls of this original part of the building. 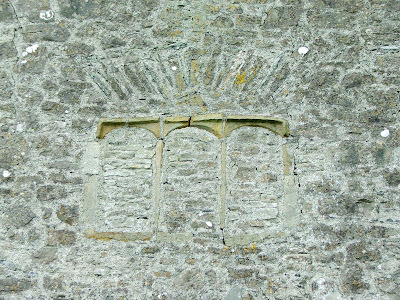 A tiny Norman windows still exists in the South wall, now only visible from the walkway between the South aisle and the chapel at the East end of the church. 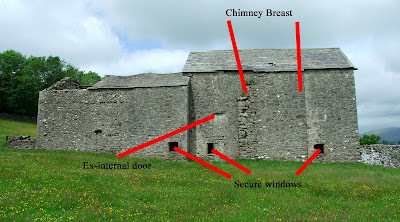 As mentioned in earlier posts, the church at Ormside contains some features that would suggest the possibility of a fortified church. 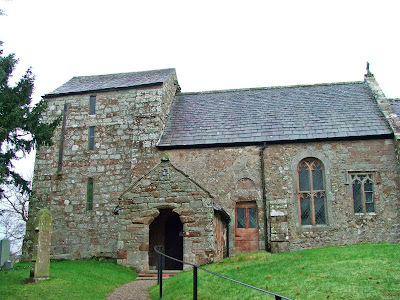 Not only does this tiny church sit on the summit of what was possibly a fortified ring work, but the tower, which dates from the 11th century, has no external door and tiny windows. 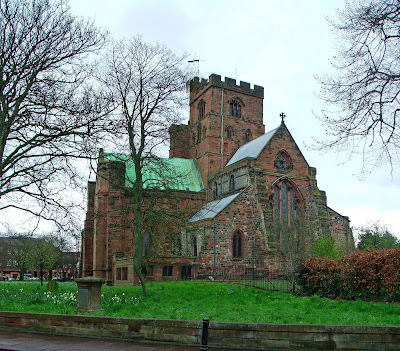 The church of St Cuthbert is undoubtedly a fortified church. The tower was built around 1380, with the express intention of providing a place of refuge for the local populace. The walls are around 4 and a half feet thick, and the only entrance is through a narrow doorway inside the church. 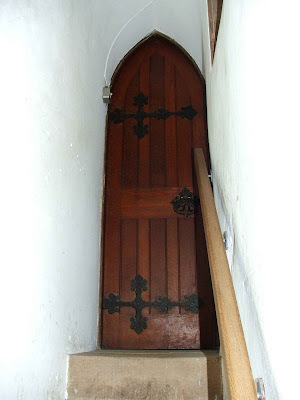 The door is protected with a thick wood and iron door, a yett, with two thick iron draw bars. 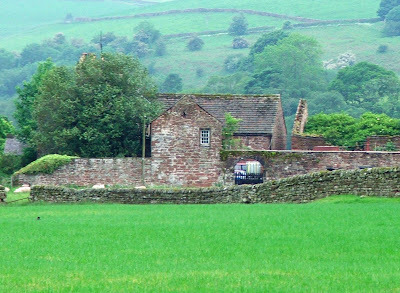 The tower was built to provide protection for the local population and the vicar, and whatever the threat was, and from whom it came, obviously continued into the early 15th century, as the Rectory across the road from the church, contains the remains of an early 15th century pele tower. 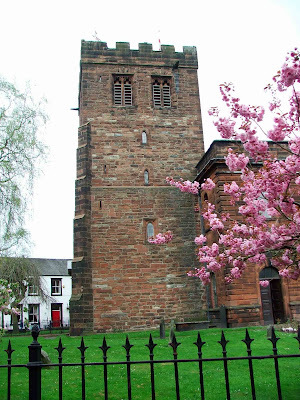 The church of St Andrew in Penrith is another church with a tower that was specifically built with protection in mind. 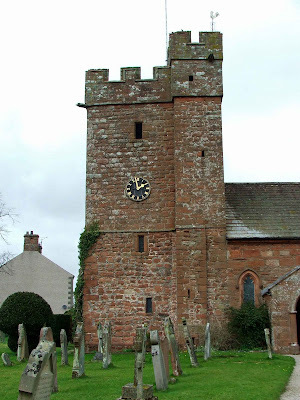 The tower possesses walls that around 6 feet thick, and although much altered today with a late 16th, early 17th century doorway, would have presented the townsfolk of Penrith with a suitably safe place to wait out any troubles that may have befallen the area. The church was subjected to a major rebuild between 1720 and 1722, and it has been mentioned that it's surprising that the tower was not replaced at the same time. It's very probable that such was the quality of the build here, that it was cheaper to keep the tower rather than waste money demolishing it. 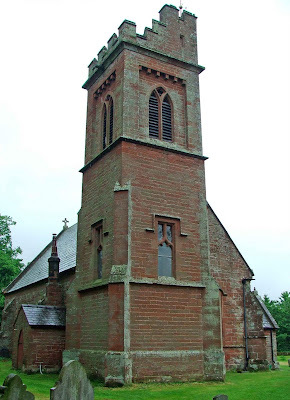 The tower was therefore incorporated into the fabric of the new church, with a few alterations made to bring it into line. 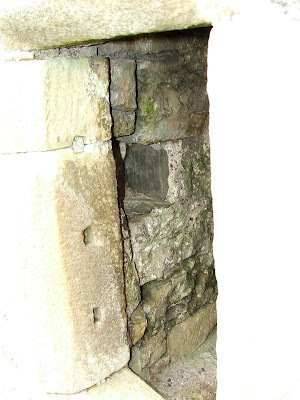 The insertion of the door into the West wall of the tower was noted as being very difficult. Not too surprising when you consider that the walls here are around 6 feet thick. The cathedral and priory, although probably not in themselves fortified, were provided with certain aspects of fortification. There were high walls all around the cathedral precincts, although only short stretches of this wall now survive. There is a gatehouse that provided controlled exit and entry to the precincts, and not one, but two fortified towers within these precincts. One tower, the Abbot's tower has all but disappeared, whilst the Prior's Tower is still standing, and still very much recognisable today...pretty much unaltered save for a few additional decorative windows. 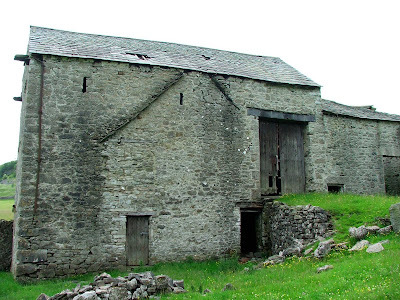 As for the priory...the building is contained within the protection of the walls and gatehouse of the cathedral precincts, but does not appear to have had any defensive aspects built into its fabric. 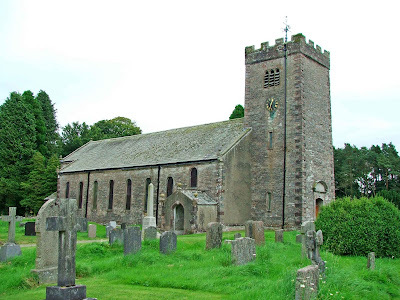 The church at Edenhall dates from, at the earliest, the 12th century. It has undergone many periods of rebuilding, redesign and renovation. 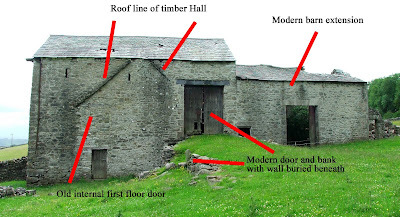 These periods of change date from the 13th, 14th and 15th centuries, and there are some obvious indications of the original building. C.J. Brooke mentions in his book, Safe Sanctuaries, that the tower of St Cuthbert's was defensible and possibly a place of refuge for the priest. 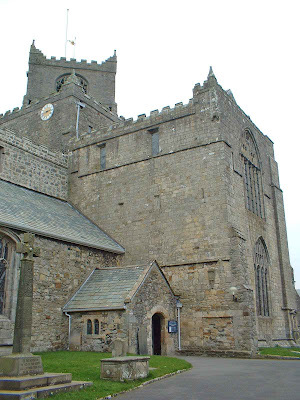 The tower dates from sometime around 1450, has huge external buttresses, thick walls and no external doors. 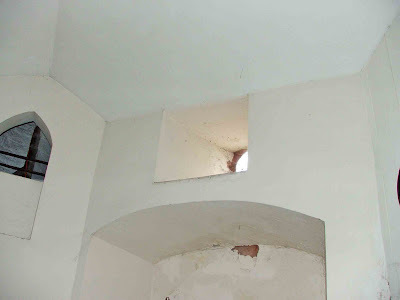 The windows in the tower we see today, were added at a later date, so before this, the tower would have had no windows at ground or first floor level. The tower is only accessible through a narrow doorway at the top of a short flight of stairs. The passageway here is only half a metre wide, and before the staircase was erected in the 19th century, this portion of the tower was only accessible via a wooden ladder or stair. The tower also possesses machicolations all around the top. 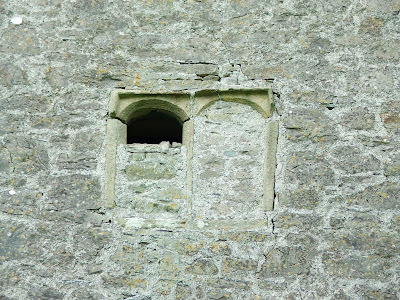 These, traditionally, would have provided the defender of a tower, with the ability to see his attacker without raising his head above the protective walls. Whether these are for decoration, or protection\defence, I'm not sure. 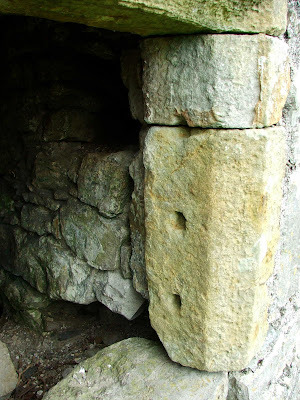 The room on the first floor, accessed through the narrow doorway, has a fireplace and storage, possibly for food, which it is said, indicates that the tower was inhabitable in times of danger, possibly only for the priest, as it is a tiny room, measuring around 2 metres by 2 metres. 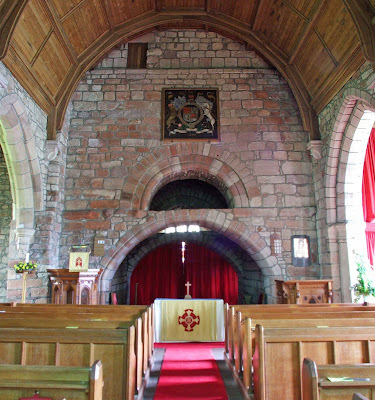 St Andrews in Greystoke dates originally from the 13th century, and like many churches in the area has undergone much rebuilding and redesign. Much of the original medieval fabric has therefore been swallowed up in later rebuilds and additions, and the true nature of the tower may also have been disguised. 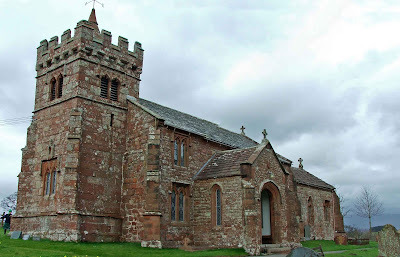 It was unfortunately completely rebuilt in 1848, thus taking away one of the original parts of this, one of the largest medieval churches in Cumbria. It is C.J. Brooke that again mentions that this church may have provided a place of refuge, although which parts of the church he would be referring to is unclear. 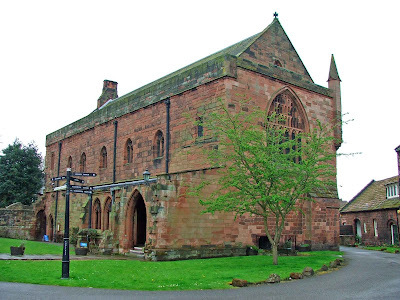 The church of St John the Baptist was largely rebuilt sometime around 1848, but much of the masonry from the earlier 14th century church appears to have been re-used in the chancel and nave walls. 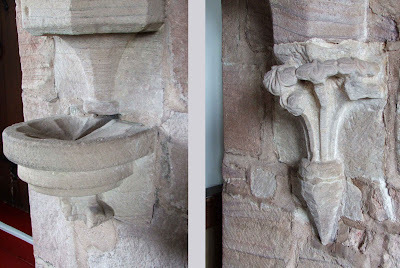 It's possible that a small piece of tower base still exists in the North East corner of the chancel....an area now used as the vestry. 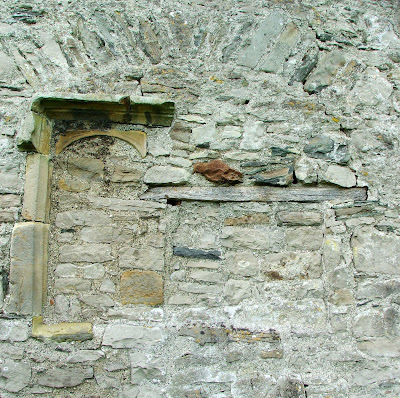 There appears to be a portion of walling jutting out from the vestry consisting of masonry from the original 14th century church. 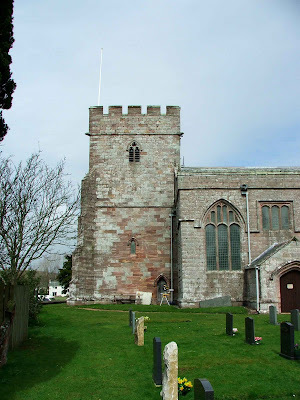 CJ Brooke suggests that the thickness of the walls here, and the position of the original tower, may suggest that this was a tower built for defensive purposes, as well as the normal ecclesiastical purposes of a church tower. 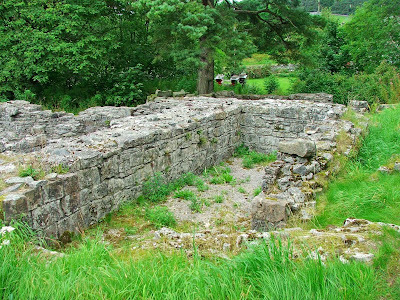 The above photo shows what could be the remains of the tower. The wall on which the coat of arms is mounted, is the West wall of this possible tower, whilst the wall in the South side, has been removed allowing entry to this area. 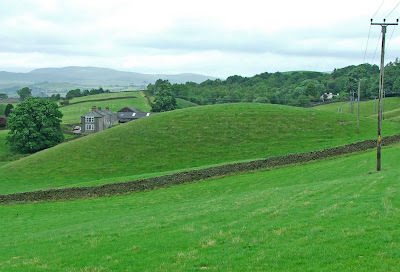 It's not the church at Ravenstonedale that interests us here, but the consolidated remains that can still be seen to the rear of the church yard. 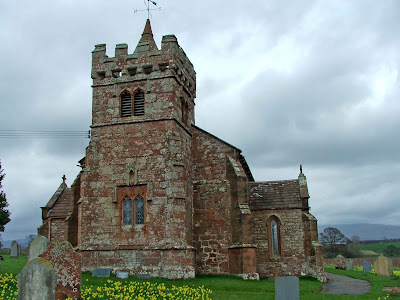 There has been a church on this site since the early 1200's, but the building we see today dates mainly from the early 1700's, with the tower dating from 1738, and the main body of the church from 1744. 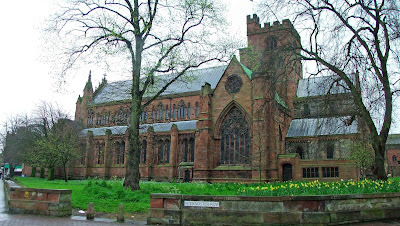 As with many churches in this area, much of the earlier masonry has been incorporated into the current building. 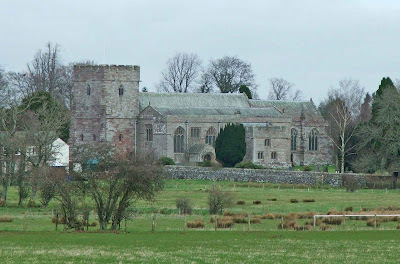 The Gilbertine priory that can be seen behind the church, probably dates from the 1200's, but may, at some point during the late 14th or early 15th centuries (possibly 1540), have been converted into a fortified dwelling, possibly a tower, possibly a defensible gaol. 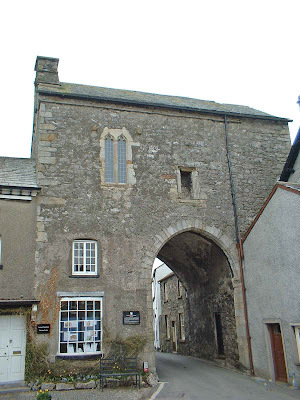 As mentioned earlier in this blog, the gatehouse at Cartmel may be viewed as a light form of defence, and would at some point, probably have formed part of a precinct wall, such as at Carlisle Cathedral. In this respect, the gatehouse can probably be regarded as a light form of fortification. There certainly do not appear to be any forms of fortification included in the remaining Priory buildings, possibly as the entire complex would have been surrounded by a high wall at some point. 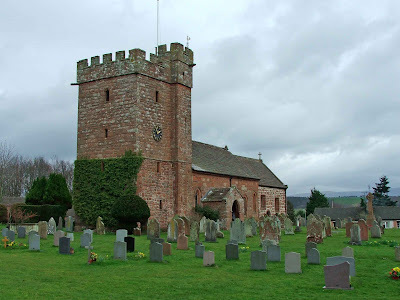 There are a few more sites scattered throughout Cumbria (Westmorland and Cumberland) some have been identified as definite fortified ecclesiastical sites, whilst others are noted as ‘possibilities’. 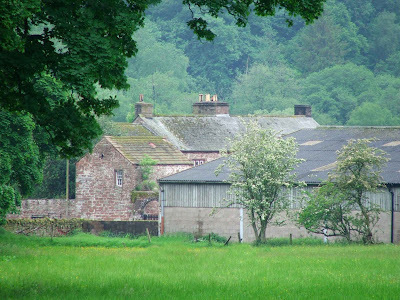 Croglin Hall can be found about three miles South West of the small village of Croglin. The hall is built well off the main road, and is only visible across the open fields from a distance (hence the quality of the photos!!) 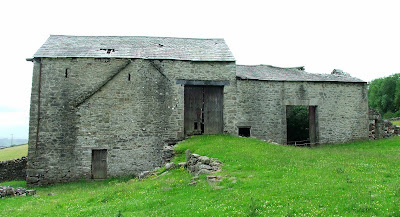 The remains of what was possibly a pele tower are built into the main part of the building (seen behind the single windowed small outbuilding) The 15th century tower was originally 2 storeys tall, but has been reduced at some point, then rebuilt, and then enveloped within a 16th century hall, which in turn was rebuilt in the 17th century. 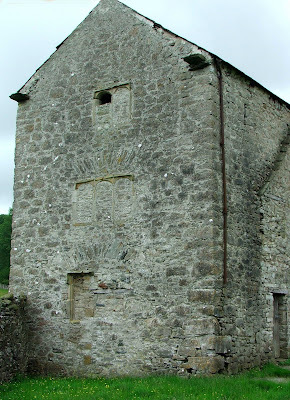 The hall has a gatehouse, built sometime in the early 17th century, with early 19th century alternations. The hall and tower house were home to the de Croglin, Dacre and Howard families, and has the dubious claim to fame of being the site of the Croglin Vampire tale. Situated behind the small church of St John in Newton Reigny, these earthworks cover quite a large area, and are still very well defined. They are roughly rectangular in shape, and consist of a raised platform, some 2 feet high, that backs onto the church grounds. The remains possibly represent the site of Newton Reigny Manor. The earthworks are very well preserved, especially as there is a small housing development that borders the West side of the bank. The church of St John has a yard that backs onto the earthworks. There is every possibility that they are connected. 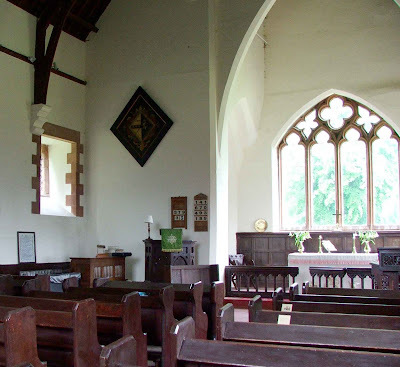 The church dates from the early 1200's, and of this period, the chancel arch survives. Other parts of the church date from the 13th century.